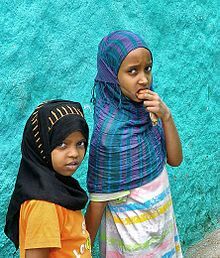 The Harari people (Arabic: هراري‎, Harari: ሐረሪ), also called Geyusu (Harari: ጌይኡሱእ) ("People of the City"), are an ethnic group inhabiting the Horn of Africa. Members traditionally reside in the walled city of Harar, situated in the Harari Region of eastern Ethiopia. They speak Harari, a member of the Ethiosemitic language group within the Afroasiatic family. The Harla, an extinct Afro-Asiatic people native to Hararghe are considered the precursor to the Harari people. The ancestors of Hararis moved across the Bab-el-Mandeb entering shores of north Somalia from Arabia, producing a semitic population among cushites and hamites in Harar. Upon the arrival of Arab Fagih Abadir the alleged patriarch of the Harari in the 10th century, he was met by the Harla, Gaturi and Argobba tribes. By the thirteenth century, Hararis were one of the administrators of the Ifat Sultanate. In the fourteenth century raids on Harar town of Get (Gey) by Abyssinian Emperor Amda Seyon I, Hararis are referred to as Harla Arabs. In the sixteenth century, walls built around the city of Harar during the reign of Emir Nur, helped preserve Harari identity from being assimilated by the Oromo. According to Ulrich Braukämper, Harla-Harari semitic group were most likely active in the region prior to the Adal Sultanate's Islamic invasion of Ethiopia. Sixteenth century saw Oromos invading regions of Somalia from the northern areas of Hargeisa to its southern portions such as Lower Juba, incorporating the Harari people. During the Abyssinian-Adal war, some Harari militia settled in Gurage territory forming the Silt'e ethnic group. Hararis were furious when Muhammad Jasa decided to move the Adal Sultanate's capital from Harar to Aussa in 1577. In less than a year after its relocation Adal would collapse. Harari imams continued to have a presence in the southern Afar Region in the Imamate of Aussa until they were overthrown in the eighteenth century by the Mudaito dynasty who later established the Sultanate of Aussa. Among the assimilated peoples were Arab Muslims that arrived during the start of the Islamic period, as well as Argobba and other migrants that were drawn to Harar's well-developed culture. Statistics prove that a Semitic-speaking people akin to the Harari may have inhabited a stretch of land between the Karkaar Mountains, the middle Awash and the Jijiga region, Oromo migrations have effectively split this putative ethnolinguistic block to the Lake Zway islands, Gurage territory, and Harar. Following the decline of the Adal Sultanate's ascendancy in the area, a large number of the Harari were in turn reportedly absorbed into the Oromo community. In the Emirate of Harar period, Hararis sent missionaries to convert Oromo to Islam. The loss in the crucial Battle of Chelenqo marked the end of Harar's independence in 1887. Hararis supported the designated but uncrowned Emperor of Ethiopia Iyasu V, and his presumed efforts to make Harar the capital of an African Islamic empire. Iyasu was however overthrown in 1916, and many of his Harari followers were jailed. Due to severe violation of Harari rights during Abyssinian rule, Hararis made several attempts to cut ties with Ethiopia and unify Hararghe with Somalia. Launching the nationalist Kulub movement linked to the Somali Youth League. These events led to the Haile Selassie government's forced displacement efforts on Hararis, to break their dominant control of Harar. A Harar Oromo proverb alludes to this occasion as: "On that day Hararis were eliminated from earth." Former Mayor of Harar Bereket Selassie reported that both the Amhara and Oromo viewed Hararis with contempt. Haile Selassie's overthrow by the Derg communist regime made minor differences for the Harari, they describe it as "little more than a transition from the frying pan into the fire". The 1975 rural act disenfranchised Hararis from their farm land, forcing many to emigrate. The surviving Harari relatives of the members to the Kulub movement would join the Somali Armed Forces and some having been promoted high-ranking military officers, fought in the Ogaden War to free Harari/Somali territory from Ethiopian rule. Hararis were also involved in WSLF. After Ethiopians won the war in Ogaden, Derg soldiers began massacring civilians in Harari areas of Addis Ababa for collaborating with Somalis. Today Hararis are outnumbered in their own state by the Amhara and Oromo people. The ruling Ethiopian government ushered in 1991 has favored Hararis tremendously. They now control their Harari Region again and have been given special rights not offered to other groups in the region. According to academic Sarah Vaughan, Harari People's National Regional State was created to overturn the historical bad relationship between Harar and the Ethiopian government. Hararis as well as the Somali Sheekhal and Hadiya Halaba clan assert descent from Abadir Umar ar-Rida, also known as Fiqi Umar, who traced his lineage to the first caliph, Abu Bakr. According to the explorer Richard Francis Burton, "Fiqi Umar" crossed over from the Arabian Peninsula to the Horn of Africa ten generations prior to 1854, with his six sons: Umar the Greater, Umar the Lesser, the two Abdillahs, Ahmad and Siddik. According to Hararis, they also consist of seven Harla subclans: Abogn, Adish, Awari, Gidaya, Gaturi, Hargaya, and Wargar. The Harari were previously known as "Adere", although this term is now considered derogatory. Arsi Oromo state an intermarriage took place between their ancestors and the previous inhabitants Adere (Harari) whom they call the Hadiya. Hadiya clans claim their forefathers were Harari however they later became influenced by Sidama. Moreover Habar Habusheed a sub clan of the Somali Isaaq tribe in northern Somalia, hold the tradition they originate from an intermarriage between Hararis and their forefathers. The Harari people speak the Harari language, an Ethiosemitic language referred to as Gey Ritma or Gey Sinan ("Language of the City"). It is closely related to the eastern Gurage languages and similar to Zay and Silt'e, all of whom are linked to the Semitisized Harla language. Old Harari already had many Arabic loanwords, proven by the ancient texts. The Zaila songs of thirteenth century origin, popular in Somalia are considered to be using Old Harari. Northern Somali dialects use Harari loanwords. Contemporary Harari language is influenced more by Oromo then Somali language and the presence of Arabic is still there. After the nineteenth century Egyptian conquest of Harar, numerous loanwords were additionally borrowed from Egyptian Arabic. Gafat language now extinct once spoken on the Blue Nile was related to Harari dialect. Harari language has some form of correlation with Swahili and Maghrebi Arabic. The Harari language was historically written using the Arabic script and in characters known as "Harari secret script" of unknown origin. More recently in the 1990s, it has been transcribed with the Ge'ez script. Harari is also commonly written in Latin outside of Ethiopia. The 1994 Ethiopian census indicates that there were 21,757 Harari speakers. About 20,000 of these individuals were concentrated outside Harar, in Ethiopia's capital Addis Ababa. Most Harari people are bilingual in Amharic and Oromo, both of which are also Afro-Asiatic languages. According to the 1994 Ethiopian census, about 2,351 are monolingual, speaking only Harari. Virtually all Harari are Muslim. The earliest kabir or Islamic teacher in the community was Aw Sofi Yahya. He arrived in Harar in 1216 as part of Abadir's retinue. Yahya subsequently established the area's first Qur'an gey, or madrasa around 10 kilometres (6.2 mi) to the south of the city center. Hararis comprise under 10% within their own city, due to ethnic cleansing by the Haile Selassie regime. Thousands of Hararis were forced to leave Harar in the 1940s. Harari people moved throughout Ethiopia, mainly to Addis Ababa and Dire Dawa, establishing families and businesses. There's a considerable Harari population in Djibouti, Saudi Arabia, Somalia and Yemen. The Harari people have also spread throughout North America, mainly to Washington D.C., Atlanta, Toronto, Dallas, Los Angeles, and Memphis. Furthermore, a minority of the Harari people live in Europe in countries such as Germany, Switzerland, Sweden and Great Britain. In Melbourne Australia, Harari communities such as Sây Harari Afocha are active. General Ali Gutu, former military general and Harari region president. ^ Lovise, Alean (22 June 2011). The Politics of Ethnicity in Ethiopia. BRILL. p. 154. ISBN 978-9004207295. Retrieved 23 February 2017. ^ Joussaume, Roger (1976). "Fouille d'un tumulus à Ganda Hassan Abdi dans les monts du Harar". Annales d'Ethiopie. 10: 25–39. doi:10.3406/ethio.1976.1157. ^ Gebissa, Ezekiel (2004). Leaf of Allah. Ohio State University Press. p. 36. ISBN 9780852554807. Retrieved 11 April 2016. ^ Abraham, Kinfe (2004). Ethiopia and the Arab world. EIIPD Press. p. 53. ISBN 9782003120749. ^ Mordechai, Abir (2013-10-28). Ethiopia and the Red Sea: The Rise and Decline of the Solomonic Dynasty and Muslim European Rivalry in the Region. Routledge. p. xvii-xviii. ISBN 9781136280900. ^ Braukhamper, Ulrich (2002). Islamic History and Culture. LIT Verlag Munster. p. 107. ISBN 9783825856717. Retrieved 12 April 2016. ^ Levtzion, Nehemia (31 March 2000). The History of Islam in Africa. Ohio University Press. p. 228. ISBN 9780821444610. Retrieved 8 March 2017. ^ Budge, E.A (1 August 2014). A History of Ethiopia: Volume I (Routledge Revivals): Nubia and Abyssinia. Routledge. ISBN 9781317649151. Retrieved 3 March 2017. ^ Stauth, Georg (2008). Dimensions of Locality. transcipt Verlag. p. 156. ISBN 9783899429688. Retrieved 24 April 2016. ^ The proceedings of the First International Congress of Somali Studies. Scholars Press. 1992. p. 155. ISBN 9780891306580. ^ Environment, livelihood and local praxis in Asia and Africa. Center for African Area Studies, Kyoto University. 2005. p. 160. Retrieved 9 March 2017. ^ Abir, Mordechai (28 October 2013). Ethiopia and the Red Sea: The Rise and Decline of the Solomonic Dynasty and Muslim European Rivalry in the Region. Routledge. p. 139. ISBN 9781136280900. Retrieved 12 March 2017. ^ Page, Willie. Encyclopedia of africaN HISTORY andCULTURE (PDF). Facts on File inc. p. 4. ^ a b Braukämper, Ulrich (2002). Islamic History and Culture in Southern Ethiopia: Collected Essays. LIT Verlag Münster. p. 37. ISBN 978-3825856717. ^ Braukämper, Ulrich (2002). Islamic History and Culture in Southern Ethiopia: Collected Essays. LIT Verlag Münster. p. 18. ISBN 978-3825856717. ^ Zewde, Bahru (17 March 2002). A History of Modern Ethiopia, 1855–1991. Ohio University Press. Retrieved 12 March 2017. ^ Bosworth, C. E (11 March 2014). New Islamic Dynasties. Edinburgh University Press. Retrieved 12 March 2017. ^ "How Ethiopian prince scuppered Germany's WW1 plans". BBC News. 25 September 2016. Retrieved 28 February 2017. ^ Feener, Michael (2004). Islam in World Cultures: Comparative Perspectives. ABC-CLIO. p. 224. Retrieved 12 March 2017. ^ Feener, Michael (2004). Islam in World Cultures: Comparative Perspectives. ABC-CLIO. p. 227. Retrieved 23 February 2017. ^ Carmichael, Tim (1998). Political Culture in Ethiopia's Provincial Administration: Haile Sellassie, Blata Ayele Gebre and the (Hareri) Kulub Movement of 1948. Boston University African Studies Center Press. p. 207. ^ Selassie, Bereket (20 September 2007). The crown and the pen: the memoirs of a lawyer turned rebel. Red Sea Press. pp. 226–227. Retrieved 14 June 2017. ^ Yigezu, Moges (2010). Language Ideologies and Challenges of Multilingual Education in Ethiopia: The Case of Harari Region. African Books Collective. p. 44. Retrieved 14 March 2017. ^ Hetzron, Robert. The Semitic Languages. Routledge. p. 486. ^ "Kulub Movement Qaxabte". Malasay.com. Malassay. Retrieved 23 February 2017. ^ Wehib, Ahmed (October 2015). History of Harar and the Hararis (PDF). Harari People Regional State Culture, Heritage And Tourism Bureau. p. 172. Retrieved 7 July 2017. ^ "Horn of Africa". Horn of Africa Journal. 1 (2): 9. 1978. Retrieved 23 February 2017. ^ Yigezu, Moges (2010). Language Ideologies and Challenges of Multilingual Education in Ethiopia: The Case of Harari Region. African Books Collective. pp. 44–45. Retrieved 14 March 2017. ^ Wehib, Ahmed (October 2015). History of Harar and the Hararis (PDF). Harari People Regional State Culture, Heritage And Tourism Bureau. p. 29. Retrieved 7 July 2017. ^ Yimam, Baye (2002). Ethiopian studies at the end of the second millennium. Institute of Ethiopian Studies, Addis Ababa University. p. 930. Retrieved 13 July 2016. ^ Braukaemper, Ulrich. A history of the Hadiya in Southern Ethiopia. Universite Hamburg. p. 9. ^ Braukamper, Ulrich. Islamic History and Culture in Southern Ethiopia: Collected Essay. LIT Verlag Münster. p. 47. ^ The Ethno-History of Halaba People (PDF). Southern Nations state. p. 164. ^ Fargher, Brian. The Origins of the New Churches Movement in Southern Ethiopia: 1927 - 1944. BRILL. p. 34. ^ Lewis, I. M. (1999). A Pastoral Democracy: A Study of Pastoralism and Politics Among the Northern Somali of the Horn of Africa. ISBN 9783825830847. ^ Gebissa, Eziekel. Leaf of Allah. Ohio State University. p. 36. ^ Braukhamper, Ulrich. Islamic History and Culture in Southern Ethiopia. LITverlag. p. 18. ^ Ramat, Palo (2007). Europe and the Mediterranean as Linguistic Areas: Convergencies from a Historical and Typological Perspective. John Benjamins Publishing. p. 6. ISBN 978-9027230980. ^ Abdi, Mohamed (2009). "Chansons de Zeyla". Annales d'Ethiopie. XXIV (24): 306. ^ Lafkioui, Mena (2013-04-30). African Arabic: Approaches to Dialectology. Walter de Gruyter. p. 5. ISBN 978-3110292343. ^ Hetzron, Robert (2013-10-08). The Semitic Languages. Taylor & Francis. p. 487. ISBN 9781136115806. ^ Pankhurst, Richard (1997). The Ethiopian Borderlands. The Red Sea Press. p. 89. ISBN 9780932415196. ^ Owens, Jonathen. Dia-Planar Diffusion: Reconstructing Early Aramaic-Arabic Language Contact. BRILL. p. 78. ^ Meyer, Ronny (2016). "The ethiopic script: linguistic features and socio-cultural connotations". Oslo Studies in Language. 8 (1): 160. ^ Cunningham, Andrew (2009). New Communities Emerging Content (PDF). State Library of Victoria. p. 15. ^ Carmichael, Tim. Political Culture in Ethiopia's Provincial Administration: Haile Sellassie, Blata Ayele Gebre and the (Hareri) Kulub Movement of 1948. Boston University African Studies Center Press. ^ Wehib, Ahmed (October 2015). History of Harar and Harari (PDF). Harari people regional state, culture, heritage and tourism bureau. p. 141. Retrieved 26 November 2017. ^ Weekes, Richard (1984-12-21). Muslim Peoples: A World Ethnographic Survey. Greenwood Publishers. p. 318. ISBN 9780313233920. ^ "Say Harari". Australia Say Harari. Retrieved 17 March 2017.